This work contains text in English and German. The new Leipzig/Halle airport has not just one, but two predecessors. One was Leipzig-Mockau airport, opened in 1923 and often still used after the Second World War in the GDR days to serve the Leipziger Messe. 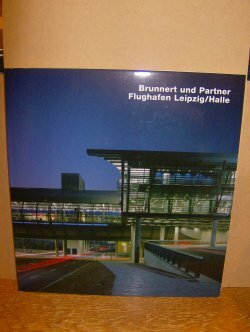 The other was Leipzig/Halle airport which opened in 1927 and by 1937 was already the second-largest airport in Germany. Passenger numbers had increased fourfold by 1994. A master plan was worked out for a second runway, intended for 3.5 million passengers per year. An open architectural competition followed and was won by Brunnert und Partner from Stuttgart. They won with a risky concept that ran counter to the master plan. Instead of filling the site between the two runways the architects designed a huge bridge structure spanning the railway track and integrating the car-park, the mall, the check-in hall, the access road and the transfer to the railway station. This concludes the first building phase, which begins at the existing terminal and ends beyond the railway lines. The concept of the bridge will not be complete until the second building phase, although it can already be made out quite clearly. 69pp.